Draft: 2003, Toronto Blue Jays, 1st rd. Is married.....wife's name is Lizzy.....the couple has two children, Paige and Stephen…Graduated from Redwood (CA) High School, where he also played football and soccer…Attended Louisiana State University, where he was 2003 SEC Player of the Year…Was a member of the 2002 United States National Team…Is involved with charities whose mission is to provide help for hungry children…Enjoys the outdoors, golf and playing the guitar. Batted .230 with 6 HR and 39 RBI in 116 games during his final season with Arizona…Made 73 starts (38g at 2B, 33g at 3B, 2g at DH…Batted .300 (9-for-30, 7rbi) as a pinch-hitter…Belted his 150th career homer on 8/11 vs. Philadelphia with a 2-run shot off David Buchanan…Was traded to Milwaukee as part of a five-player deal on 1/30/16. Hit .244 (122-for-501) with 26 doubles, 10 home runs and 60 RBI in 133 games with the D-backs... Is 1 of 6 second basemen with 20+ doubles in each of the last 6 seasons (also Robinson Cano, Howie Kendrick, Ian Kinsler, Brandon Phillips and Dustin Pedroia)... Made 116 starts at second base and 7 at third base…his start at third on Sept. 4 @ Padres was his first since Sept. 18, 2005 vs. Yankees... Finished fourth among NL second basemen with a .988 fielding percentage (7 E in 569 TC), the third-highest of his career (min. 100 games)…only his .992 (2012) and .991 (2009) marks were better…was second in the NL with 5.02 total chances per 9.0 innings... Recorded a walk-off single in the 14th inning on June 24 vs. Indians (11th career walk-off plate appearance)...Along with wife, Lizzie, served as honorary chairs of the club's annual charity event, Evening on the Diamond, on March 27. Played in just 87 games due to injury in his second full season with Arizona and hit .291 (95-for-327) with 21 doubles, 11 home runs and 41 RBI... Reached the 10+ homer mark in back-to-back seasons for the second time in his career (also 2008-09)... Averaged 12.48 plate appearances per walk, his best mark since his rookie season in 2005 (11.97)... Recorded walk-off hits on Aug. 14 vs. Orioles (14th-inning single off Bud Norris) and Aug. 27 vs. Padres (10thinning single off Dale Thayer)... On 15-day disabled list from April 15-June 25 with a broken left hand…suffered the injury after being struck by James McDonald on April 9 vs. Pittsburgh... 13-game hitting streak from Aug. 6-20 (.426; 23-for-54), including a career-high 5 straight multi-hit games from Aug. 7-12... Homered in 3 consecutive games from Aug. 10-12, tying a career high (also June 18-20, 2012)... Batted .372 (35-for-94) in August, fifth-best in the NL... D-backs' Roberto Clemente Award nominee. Selected by The Sporting News as the National League All-Star second baseman and as the D-backs' Most ValuablePlayer by the Arizona Chapter of the BBWAA after batting a career-high .302 (184-for-609) with 44 doubles, 6triples, 26 home runs and 85 RBI in his first full seasonwith Arizona...also established career highs in sluggingpercentage (.552), OPS (.882) and extra-base hits (76)...Earned his second Silver Slugger Award at second base,the first D-backs infielder to garner the award...Named a finalist for the Hank Aaron Award, which recognizes the most outstanding offensive performer ineach league...Recorded third career 20-homer season (also 2009-10)and third by a D-backs second baseman, joining Jay Bell(36 in 1999) and Kelly Johnson (26 in 2010)...85 RBIwere the most by an Arizona second baseman since Bell's110 in 1999...Hit for 2 cycles (June 18 vs. Mariners and June 29 @Brewers), the second player in the modern era of MajorLeague Baseball to hit for a pair of cycles in a season (alsoBrooklyn Robins' Babe Herman in 1931)...John Reilly(1883 with Cincinnati Red Stockings) and Tip O'Neill(1887 with St. Louis Browns) also hit for 2 cycles in aseason in the American Association...Led all NL second basemen in average (.300), home runs,doubles, BI, total bases(316), on-base percentage (.358)and slugging percentage (.521)...statistics as second baseman only...Ranked among NL leaders in doubles (T-2nd) and totalbases(3rd, 318)...Is 1 of 5 players in D-backs history to hit at least .300with a .500 slugging percentage or better, joining LuisGonzalez (1999-2001, '03), Matt Williams (1999), ChadTracy (2005) and Justin Upton (2009)...Ranked third among NL second basemen with a .840zone rating and fourth with a .992 fielding percentage (6E in 757 TC)...Hit his 100th career home run on April 7 vs. Giants...Became the fifth D-backs player to hit for the cycle onJune 18 vs. Mariners and first to do so in only 4 plate appearances...Homered in 3 straight games for the first time from June18-20...also collected a double and home run in eachgame during that span, the first D-backs player to accomplish the feat and first player in baseball to do so sinceEvan Longoria from June 25-27, 2008...Collected his 1,000th hit as part of his second cycle onJune 29 @ Brewers...Hit safely in 19 straight home games from May 23-July 4,tied for the third-longest streak in club history (also WillieBloomquist from Aug. 9, 2011-April 8)...Appeared in his 1,000th game on July 22 vs. Astros...Career-high 5 hits on Sept. 4 @ Giants, going 5-for-5with a double, home run, 2 RBI and a walk. Combined to hit .246 (128-for-520) with 27 doubles, 8 homers and 61 RBI in 137 games between the Blue Jays and D-backs...set a career-high with 21 stolen bases...Batted .315 (39-for-124) with 12 doubles, 2 home runs and 16 RBI in 33 games with the D-backs, compared to .225 (89-396) in 104 games with the Blue Jays...On the disabled list from April 20-May 8 with a strainedright hamsting...played in 2 rehab games with Single-A Dunedin...Hit his first career grand slam on May 29 vs. White Sox...Traded to the D-backs on Aug. 23 with INF John McDonald for INF Kelly Johnson...Hit safely in 16-of-17 games from Aug. 28-Sept. 14, including 13 straight (.415, 22-for-53)...POSTSEASON: Hit .278 (5-for-18) with 1 home run, 1 RBI and 5 walks in 5 NLDS games vs. Brewers...hit a solo homer in Game 4 (off Chris Narveson). Played in 138 games for the Blue Jays starting 137 at 2B and one at DH... POWER STROKE: Hit 25+home runs in back to back seasons (62 total) and had 48 extra-base hits... Ranked 2nd among AL 2B with 26 home runs (Cano 29)... Hit a home run in back-to-back games four times... On Aug. 7 vs. TB had his only multi-home run game of the season (3rd career) and matched his career high in runs batted in with four (2nd time)... June 14 at SD had a career high three doubles... LET'S GO HOME: Hit a walk-off single in 14th inning June 5 vs. NYY... DISABLED LIST: Was on the DL from Apr. 7-23 with a right hamstring injury... STREAKING: Had a season high seven game hit streak from Aug. 11-17where he hit .308 (8-for-26)... WALK 'EM OFF: Twice this season provided the game-winning single, June 5 vs. NYY (14th inn) and Aug. 27 vs. DET (11th inn)...TROUBLE WITH LEFTIES: Batted .125 vs. left-handed pitchers (15-120), with threedoubles and three home runs. Was awarded the AL Comeback Player of the Year by Major League Baseball Was awarded and AL SilverSlugger, representative of the best offensive player at his position for his accomplishments in the 2009 season... Played in 158 games a year after losing the majority of his 2008 season to a concussion... Posted career-highs with 36 homeruns, 108 RBI, 195 hits, 103 runs scored and 682 at-bats... BOMBS AWAY: Led Major League second basemen with 36home runs and 107 RBI... The 36 home runs as a second baseman were tied for third-most in A.L. history behind AlfonsoSoriano's 39 home runs in 2002 and 38 in 2003...In fact, the 107 RBI are the most by any Major League second basemansince Bret Boone recorded 117 in 2003... His seven homeruns in each of May, June & August represented career highs...June 28 vs. PHI, recorded his first multi home run game of his career (would add another, July 25 vs. TB), marking #18 &19 of the season passing Roberto Alomar for the career mark for home runs by a second basemen in a single season...LEAGUE LEADER: Ranked 5th in hits (195), 2nd in total bases (340), T-5th in multi-hit games (57), T-3rd in home runs(36), T-5th in RBI (108) & 6th in extra-base hits (73)... Also led all #2 hitters in hits, home runs, runs batted in, extra-basehits & total bases... STAR GAZING: Was selected to his first career All-Star Game and started the game at second baseafter Boston's Dustin Pedroia could not attend... Went 0-3 in the contest... OUT OF THE GATE: Became the fastest to 50hits, measured in games (31), in Blue Jay history... His 38 hits in April ranked T-3rd on the all time Club, one shy of Hillenbrand(39 - '05) & Stewart (39 - '01)... Held a .365 batting average at the conclusion of April... BIG DAYS: Collected acareer high four hits on two occasions marking the 8th & 9th times he has done so in his career... TOP DUO: Adam Lind(114 RBI) & Aaron Hill (108 RBI) have become just the 2nd pair in Blue Jays history to record at least 35-HR, 35-2B & 100-RBI in the same season... Also, the 221 combined RBI between the two are the most by a Blue Jay duo since 2003 whenDelgado (145) & Wells (117) combined for 262. Played in just 55 games this season aftersuffering a concussion that occurred in the 9th inning on May 29 at OAK after colliding with SS David Eckstein... Batted .263 (54-205) with two home runs & 20 RBI including 14 doubles in 55 games played (53 starts)... ON THE SHELF:Was placed on the 15-day DL on June 7 (retro to May 30)with a mild concussion... Matched a career high with afour-hit game vs. the A's on Apr. 8... Was the 7th time in hiscareer to record four hits in a game... Was batting .444(12-27) with seven RBI after his first eight games of the season...Had a season high nine game hit streak from May12-21 & batted .394 (13-33) over that span... Committedjust one error in 238 total chances at second base thisseason (479.0 innings). Posted a career high with 17 home runs and 78 RBI...On Apr. 12 vs. DET, became the 1st Blue Jaysecond baseman in Club history to have exceeded 10 RBI over their first 10 games to start any one season...Hill had reached that mark in nine games...Apr. 22-23 hit home runs in back to back contests...Hit his 4th HR of the season onApr. 23 at BOS...Did not hit his 4th home run of the 2006season until Sept. 15 vs. Tampa Bay (team game #147 & his140th game)...AGRRESSIVE BASE RUNNING: On May29 vs. NYY became just the 2nd player in Club history to recorda straight steal of home...It also marked just the 2ndtime in Club history a Blue Jay turned the trick on a straightsteal (last was Raul Mondesi on Apr. 17, 2001 vs. NYY)...Itrepresented the 1st steal of home by a Blue Jay since SheaHillenbrand (Aug. 26, 2005 vs. NYY)...WALK IT OFF: June5 vs. TB became the 1st player since 1974 to leadoff an inningwith a walk & the game-winning walk in the same inning...Aug. 19 vs. BAL won the game on a walk-off sac fly inthe 10th inning...WHERE HE RANKED: Among AL 2ndbaseman, led in games (160), innings played (1410.0), assists(560), assists/9 innings (3.57) & doubles(47)...Ranked 2nd in total chances (818) & double plays(114)...Ranked 2nd in RBI (78), SLG (.460), 4th in hits (177)& 4th in home runs (17)...SECOND BEST: His 17 homeruns match the most by a Blue Jay 2nd baseman in Club historywith Roberto Alomar's 17 in 1993...His 78 RBI are the2nd most by a Blue Jay 2nd baseman in a single season(Alomar 93 RBI in '93)...His 160 games played, ties him for1st with Roberto Alomar for the most in a season by a BlueJay 2nd baseman...On Sept. 16 vs. BAL, set a new singleseason Club record for doubles by a Blue Jay 2nd basemanwith his 42nd double of the year...Surpassed Alomar's markof 41 doubles (1991)...Ranked 3rd in the AL with 47 doublesthis season (M. Ordonez led with 54)...The 47 doublesplaced him 4th for the most doubles in a single season inClub history (2nd most by a right-handed hitter)...The 47doubles by Hill are the most by an AL 2nd baseman sinceBrian Roberts (50) & Ronnie Belliard (47) in '04...ASTRONG FINISH: Finished the season on a career high15-game hit streak to match the longest by a Blue Jay (F.Thomas)...Batted .453 (29-64) with eight doubles & twohome runs over that stretch...Enjoyed a multi-hit effort in 11of his last 15 contests, including seven of his lastnine...Among the AL leaders in September, ranked 1st inhits (43), T-2nd in runs (23), 4th in batting average (.406) &4th in doubles (10)...On Sept. 29, batted 4th in the lineup forthe 1st time in his career...In fact, it marked just the 2nd timein Club history that a Blue Jay 2nd baseman batted in thecleanup position...Damaso Garcia was the only other 2ndbaseman to do so, on just one occasion, back on Sept. 4,1980 vs.CWS...QUITE THE HONOUR: Was named the TorontoBBWAA Player of the Month for both April and September...In April, batted .313 with five home runs and 20RBI...Was T-4th in the AL with nine doubles in April...Batted.406 with three home runs and 10 RBI in September...Wonthe 2007 Fielding Bible Award for second base (among allof MLB), chosen by a panel of 10 experts, including BillJames and John Dewan. Was 2nd on the team with 155 games played...Batted.400 with the bases loaded (14-25), with nine RBI...Was batting .305 (highest point of the season) on July 26...Raised his batting average .091 points from May 16-June 14... Batted .400 (40-100) over that time period... Hit his 1sthome run of the season on May 24 vs. TB (42nd game/148AB's)... Hit four of his six home runs in September...Led theAL in July in batting avg., hitting .361 (35-97). Ranked among the AL rookie leaders with a .274 batting average (6th), 40 RBI (10th), 24 multi-hit games (7th), 49 runs scored (9th), 99 hits (8th), 139 total bases (10th), 25 doubles (T-6th), 31 extra base hits (9th), a .342 on base percentage (5th) and a .385 slugging percentage (7th)...Hadthe longest hitting streak by both a Blue Jay and an ALrookie hitting safely in 13 straight games between June 27and July 15... Began the season with Syracuse in the InternationalLeague (AAA), but had his contract purchased on May 20 in the wake of an injury to Corey Koskie...Made hisMajor League debut on May 20 vs. WAS as Toronto's designatedhitter... Collected his first career hit in the fourth inning,tripling to left centre to score a pair of runs in a 6-1Toronto win... Hit safely in each of his first five games withToronto...Through the end of May, hit safely in nine of hisfirst 11 games, with a .415 batting average and 11 RBI...Hisfirst career home run came on June 20 vs. BAL as part of hisonly four-hit game of the season. Named R. Howard Webster Award Winner for NewHampshire (AA)... Selected to participate in 2004 Eastern League All-Star Game... Named New York Mercantile Exchange All-Star Futures Game MVP... Named as the Blue Jays Organizational Player of the Month in July after batting .386, with two home runs and 20 RBI... Named EasternLeague Midseason and Postseason All-Star... Named as aBlue Jays Minor League Star of the Month in August afterbatting .276, with four home runs and 22 RBI. The Blue Jays 2003 first round pick began the yearwith Auburn, but was promoted midseason to Dunedin...Was named as the year-end winner of the New York Penn League's Stedler Award, given to the top pro prospect, after batting .361 with four home runs and 34 RBI in 33 games with Auburn...Tied for the team high with seven hits in sevenpostseason games... Was selected by Baseball Americaas the 6th top prospect in the organization. June 29, 2017 San Francisco Giants released LF Aaron Hill. June 24, 2017 San Francisco Giants designated LF Aaron Hill for assignment. May 26, 2017 San Francisco Giants activated LF Aaron Hill from the 10-day disabled list. May 20, 2017 San Jose Giants sent LF Aaron Hill on a rehab assignment to Sacramento River Cats. 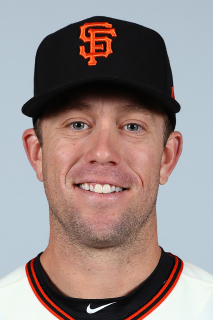 May 16, 2017 San Francisco Giants sent LF Aaron Hill on a rehab assignment to San Jose Giants. April 24, 2017 San Francisco Giants placed LF Aaron Hill on the 10-day disabled list. Right forearm strain. April 2, 2017 San Francisco Giants selected the contract of 3B Aaron Hill from Sacramento River Cats. March 30, 2017 3B Aaron Hill assigned to Sacramento River Cats. February 24, 2017 San Francisco Giants invited non-roster 3B Aaron Hill to spring training. November 3, 2016 3B Aaron Hill elected free agency. July 7, 2016 Milwaukee Brewers traded 3B Aaron Hill and cash to Boston Red Sox for 2B Wendell Rijo and RHP Aaron Wilkerson. June 25, 2013 Arizona Diamondbacks activated 3B Aaron Hill from the 15-day disabled list. June 15, 2013 Aaron Hill roster status changed by Tucson Padres. June 15, 2013 Arizona Diamondbacks sent 2B Aaron Hill on a rehab assignment to Reno Aces. April 16, 2013 Arizona Diamondbacks placed 2B Aaron Hill on the 15-day disabled list retroactive to April 15, 2013. Broken left hand. November 15, 2011 Arizona Diamondbacks signed free agent 2B Aaron Hill. October 31, 2011 2B Aaron Hill elected free agency. August 24, 2011 Arizona Diamondbacks activated 2B Aaron Hill. May 8, 2011 Aaron Hill roster status changed by Toronto Blue Jays. May 5, 2011 sent 2B Aaron Hill on a rehab assignment to Dunedin Blue Jays. April 25, 2011 Toronto Blue Jays placed 2B Aaron Hill on the 15-day disabled list retroactive to April 20, 2011. Sore right hamstring. April 23, 2010 Toronto Blue Jays activated 2B Aaron Hill from the 15-day disabled list. April 12, 2010 Toronto Blue Jays placed 2B Aaron Hill on the 15-day disabled list retroactive to April 8, 2010. Tightness in his right hamstring.